Vanilla is a member of the orchid family, the largest and oldest family of flowering plants in the world. Vanilla is the only edible fruit of the entire orchid family, which includes roughly 25,000 orchid varieties and over 10,000 hybrids. It grows best in the moist, tropical regions of the world 15-1/2 degrees to the north and south of the Equator. Vanilla is a food of the Americas, originating in what is now Mexico, Central America, northern South America and the Caribbean. It is both an epiphyte, a plant that uses nutrients from the air, and a root producing orchid. It is a vine and must have a support (tree post, etc.) on which to grow. Vanilla is the most labor-intensive agricultural product in the world, which is why it is so expensive. After planting a three-foot (one meter) vine cutting, it will take at least 1-1/2 years before the vine flowers. The flowers must be hand pollinated. The beans remain on the vine for nine months. They are harvested by hand, must then go through a curing, drying and resting period, which takes three to five months. It takes at least three years from planting to sale. That said, farmers make pennies on the dollar for their beans. The people who make the most money are often the middlemen and the speculators who invest in vanilla. Vanilla grows best 15-1/2 degrees north and south of the equator, but only in moist humid regions. Vanilla is native to the Americas. The center of the American vanilla industry is in the northern part of Veracruz state, but production in Mexico is currently very limited. The majority of vanilla is now produced on the island of Madagascar in Africa. East Africa also produces vanilla. Indonesia, Papua New Guinea, India and Polynesia grow vanilla for sale. Vanilla is also grown in the Caribbean, and even Hawaiians grow vanilla, but production is small and mostly sold locally to tourists. Vanilla beans are technically the ovary of the vanilla orchid. The orchids flower once a year and live for less than a day. In their native Mexico, they are occasionally pollinated naturally by two varieties of bees. Most of the time, vanilla orchids are pollinated by hand everywhere they are grown. Within three days after pollination, the vanilla bean appears. It grows to its full length within two weeks but must stay on the vine for nine months before being picked by hand. It will have no flavor or fragrance when it is picked. Once picked, vanilla beans go through a very intensive month to six weeks of processing. They are cured, dried and then massaged to bring up their fragrant oils. They will be sorted by size, allowed to rest for a month or two, then bundled, before being shipped. They are handled hundreds of times before they are ready for you to use. There are two types of vanilla beans used for cooking: Vanilla planifolia and Vanilla tahitensis. Vanilla planifolia is the type of vanilla most frequently used in baking, ice creams, etc and has the flavor most of us associate with vanilla. 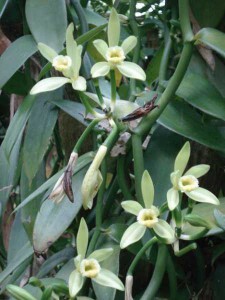 Vanilla tahitensis is a cross between Vanilla planifolia and Vanilla odorata. The plant stock was taken to Tahiti by sailing ship in the mid-1800s, but it wasn’t grown to sell until the turn of the twentieth century. It became known as Tahitian vanilla at that time. What Part of the Vanilla Bean is Used for Cooking? Although TV chefs often use just the small seeds in cooking and discard the rest of the bean, the entire vanilla bean can be used! 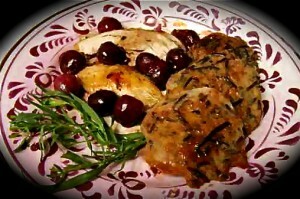 The entire bean is flavorful and it can be reused. If you are making a custard, ice cream base or sauce on the stove top, you will use anywhere from 1/3 of a vanilla bean to 1 whole bean, based on the size of your recipe and whether vanilla is the main flavor for what you are making. Slice the bean open before adding it to the mixture. Leave the bean in the mixture until it has cooled or even overnight. Carefully rinse and dry the bean and put it in your sugar jar to flavor your sugar or, wrap it to save and use again. We have vanilla bean recipes right here for you to enjoy and experiment with. What are Bourbon Vanilla Beans? Traditionally the term “Bourbon Vanilla Beans” has meant vanilla beans grown on islands in the Indian Ocean. The island of Reunion was once called Ile de Bourbon, and vanilla was grown on this island. However, the majority of the world’s vanilla beans are grown on the island of Madagascar. This is why you will sometimes see the beans labeled Madagascar Bourbon beans. The term now means Vanilla planifolia beans grown anywhere except for Mexico. In Mexico they are called Mexican beans. The finest quality Tahitian vanilla beans are grown in Tahiti. They are significantly different from the Bourbon or Mexican beans in both appearance and flavor, but they are both used the same way. Tahitian beans are typically more fruity and floral than Bourbon and Mexican beans, but they have less natural vanillin, the flavor we most often associate with vanilla. They are especially nice to use in fruit or cream desserts or in seafood dishes. They are considerably more expensive than Bourbon or Mexican beans. Papua New Guinea also produces Tahitian beans. However, they are thinner, drier, and and not quite as intensely flavored as the true Tahitian beans. Because they are significantly less expensive, they are used to make most Tahitian vanilla extracts. Pure vanilla extract is the concentrated flavor of vanilla beans. In the United States there is a Standard of Identity for pure vanilla extract. It requires that the extracts be made from 35% alcohol, a minimum of 13.38% vanilla bean extractives and purified water in order to be called pure vanilla extract. Sugar, corn syrup, caramel color (which also contains sugar) and other additives are permitted and are supposed to be listed on the label, but frequently aren’t. If you are concerned about whether the extract you are using contains sweeteners, it is best to contact the manufacturer. Vanilla that does not contain alcohol is not allowed to be called pure vanilla extract. Its correct name in the Standard of Identity is Vanilla Flavor or Pure Vanilla Flavor. It is most frequently made with propylene glycol, a viscous, colorless liquid that has no flavor but has a slight sweetness to it. Vanilla flavor contains vanilla bean extractives and purified water. It may also contain sugar or corn syrup. Some individuals are allergic to propylene glycol, which can cause a rash in people sensitive to the chemical. What Color is Pure Vanilla Extract? Pure vanilla extract is a light amber color. It can be difficult to see its color as it is most often sold in amber colored bottles in small sizes. Pour some into a clear container or into a small bowl then take it into bright light. If it does not contain caramel color, you will see that it is very clear and a light-to-medium amber color. You may also notice that it is slightly oily. That is from the natural volatile oils in the vanilla beans. If it is darker the extract probably contains caramel color. Does Pure Vanilla Extract Contain Sugar? Most pure vanilla extracts do contain sugar or corn syrup as the sugar helps to soften the harsh nose of the alcohol. They also may contain caramel color, which also contains sugar. You will need to discuss this with the extract manufacturer or supplier to determine if it contains sweeteners. Does Pure Vanilla Extract Contain GMO’s? This depends on the type of alcohol it is made from and if it has sweeteners in it. If it is made from sugar cane alcohol and does not contain corn syrup or beet sugar, it is GMO-free. If it contains grain alcohol, the alcohol is made from corn. If it is certified organic extract, the alcohol is probably GMO-free. You will need to discuss this with the extract manufacturer or supplier for specific information. Is Pure Vanilla Extract Gluten-Free? Unless the extract contains a wheat-based alcohol or has other additives, it is probably gluten-free. You will need to discuss this with the extract manufacturer or supplier to confirm that it is. 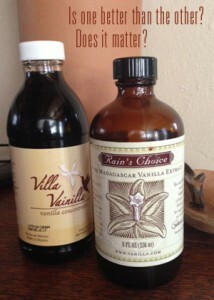 What is Clear or White Vanilla Extract? Clear or white vanilla extract is an imitation vanilla made from synthetic vanillin. In the United States it must be labeled “Imitation Vanilla”. In England imitation vanilla is usually labeled “Vanilla Essence.” In Mexico and all through the Americas, it is almost always labeled as vanilla extract or with other words that make purchasers believe it is pure vanilla. Chances are 99.9% that it is imitation. What is Double or Triple Fold Vanilla? Vanilla extracts can come in single fold, which is the type that you purchase in small bottles, or it can be much two, three and four times stronger. The technical term is double, triple, etc. fold vanilla. It goes up to 20 fold, but it is far less stable after four-fold, so most manufacturers don’t use the really high-fold vanillas. When making multiple fold vanillas, more vanilla bean extractives are added to the mixture, but the same amount of alcohol as single fold is used. Bakeries, baked-goods manufacturers and the dairy and frozen dessert industries often use multiple-fold vanillas. Another advantage for using multiple-fold vanilla is to save money on long-distance shipping. Most home bakers use single-fold extracts, though some enjoy using double-strength because of its stronger flavor profile. When you purchase frozen desserts, dairy products and processed cookies and cakes, you may notice that it sometimes says, “Natural Flavors” in the ingredients. This term indicates that the product probably has imitation vanilla made from wheat germ extract or DNA created on a 3D printer mixed with highly genetically-engineered yeast. This is a loophole that some manufacturers use when producing products that appear to be made with pure vanilla. If the product is made in the US using Mexican beans and following the Standard of Identity, it is absolutely safe. There are a couple of extract producers in Mexico, but it isn’t easy to find their products. They are made in a safe manner. The rest of the so-called vanilla throughout the Americas is not regulated, so it’s difficult to know what’s in the bottle besides imitation vanilla. In the 1980s there was a scare because producers used coumarin in the liquid Mexican vanillas. Coumarin is not toxic in minute amounts, but it is a probable carcinogen if used daily, which isn’t likely in the case of flavorings. Further, coumarin, which made the imitation vanilla smell more like real vanilla, is now rarely used in Mexico. That said, dyes banned in the US and other additives that are sometimes put into the imitation vanillas could be toxic to sensitive people. Personally, the biggest issue with the cheap imitation vanilla is that it undercuts the farmers who are struggling to keep the vanilla industry alive. Are Mexican Vanilla Beans Safe? Coumarin has never been applied to Mexican vanilla beans, so yes, they are perfectly safe. However, except in rare instances, such as in the Mexican vanilla growing region, vanilla beans are not easily available in Mexico at this time. Climate change and political unrest have both impacted the Mexican vanilla industry, and there is very little Mexican vanilla available. To complicate things further, vanilla beans from other origins, such as Madagascar, have been shipped to Mexico in recent years and sold as Mexican vanilla beans! Mexican beans often cost more than Madagascar beans. Some vanilla extract producers have customers who depend on Mexican extract to flavor their products. For this reason, there is a market for Mexican beans. Unfortunately, there is very little transparency in the vanilla industry, so issues such as this are difficult to trace. There are two types of vanilla bean powder and two types of vanilla powder used in the vanilla industry. We’ll start with the vanilla bean powder. The first is pure ground vanilla bean powder. It is exactly what the name indicates. As the entire vanilla bean has flavor, it makes sense to grind the entire bean to use as a non-alcohol-based flavoring. The ground beans are often passed through a fine-mesh screen to assure that the powder specks are consistent in size. The ground powder works well to flavor foods and can be used in place of extract. 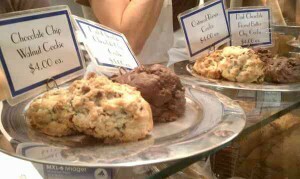 It is often used in scone, cake, cocoa and other dry packaged mixes and granola. It can be added to sugar for beverages, but it does not dissolve. The second vanilla bean powder is from expended (also known as exhausted) ground vanilla bean powder used in the extract making process. The ground powder is dried and sold to the frozen dessert and dairy manufacturers to use instead of freshly ground vanilla bean powder for vanilla bean ice cream and other products. The expended powder has very little, if any, flavor or fragrance but it’s very inexpensive, which is why it’s preferred by commercial manufacturers. Artisan gelato and ice cream producers frequently use the freshly ground vanilla bean powder. Vanilla powders come in two forms: pure and imitation (synthetic). Pure vanilla powder is made by ribbon spraying pure vanilla extract onto dextrose powder. The powder is used to flavor hot beverages and as a substitute for pure vanilla extract. It is beige-to-light brown in color and is sweet. Imitation vanilla powder is dried synthetic vanillin. Because it has no fragrance of its own, the powder often contains coumarin in European countries where coumarin is not banned, as coumarin has a vanilla-like aroma. Coumarin comes from the tree Dipteryx Odorata, a native of Central and northern South America, which also produces seeds known as tonka beans. Imitation vanilla powder smells good but has a bitter undertaste from the coumarin. Vanilla paste is made from a combination of vanilla extract and ground vanilla bean powder. It is actually more like a runny glue than a paste and its ingredients vary by manufacturer. Some vanilla pastes are made from a multi-strength extract and freshly ground vanilla bean powder. It usually contains xanthan gum as a thickener and may also contain sugar or corn syrup. Some pastes may use the expended vanilla bean powder instead of the fresh. Vanilla paste can be substituted for either vanilla extract or ground vanilla bean powder. In some respects, it’s the perfect marriage between the two products. It does contain alcohol, but not at the same strength as extract. Vanilla oleoresin is a highly concentrated form of vanilla, made by removing the solvent from vanilla extract. A solution of isopropanol is frequently used instead of ethanol for the preparation. Some aroma is lost during removal of the solvent, but the essential oils remain. Vanilla oleoresin is only used in non-food products. It is expensive but will impart the best aroma to perfumes, bath oils and soap. Vanilla absolute is the most concentrated form of vanilla. It is sometimes used in perfumes and other aroma-based products. Because it’s so expensive, nearly all candles, soaps, and other scented specialty merchandise, are made from synthetic vanillin. Vanilla Absolute is used in very high-end products in small quantities, often mixed with other fragrances in perfumes. However, a little goes a long way. If you are making perfumes, soaps or candles and you don’t want the cloying aroma of imitation vanilla, it may be worth investing in vanilla absolute. Learn about the history of vanilla here. I am going to buy vanilla bean from your site. I checked on different websites but your exhaustive research, love and care for vanilla won me over. I have one question for you. I thought that I would be purchasing vanilla beans to make my own vanilla extract but now I am not sure if it is worth it or if I should use it only as it is, scraping the seeds out of pod into recipes or to infuse a vanilla flavor into sugar and salt. 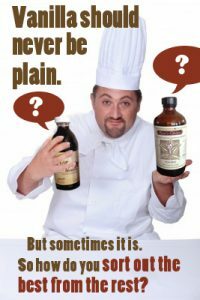 I am asking you this, because I thought that it would be cheaper for me to actually make my own vanilla extract but I read somewhere that commercial vanilla extract is made in huge quantities and infused in a gallon of alcohol, and therefore does not compare to homemade because the commercial one is stronger due to a higher ratio of beans to alcohol. On the other hand I found many blogs that suggest homemade vanilla extract as less expensive than commercial ones… I would really appreciate reading your thoughts on this. Lillie, commercial extract is stronger than homemade, but a lot of people enjoy making it. Not all commercial extracts are the same quality, however, so this is a general statement on my part. Please note that the entire bean has flavor so don’t throw out the pods after you scrape out seeds. Put them in your sugar jar or coffee grounds; they’re especially expensive right now, so make sure you get every bit of flavor from them. Bon appetit! Question: what is the best way to store vanilla beans and your extracts and pastes? I’m not a commercial cook and won’t use them up fast. But I really like buying in large quantities. Thanks for sharing your passion. I am a flavor and quality enthusiast when it comes to vanilla, chocolate, coffee and wine. So I greatly appreciate what you bring to my kitchen – especially in regards to vanilla!